Now, I don’t know what your impressions of Bangladesh are, or even if you have any. It’s not a country that often features highly on people’s “bucket lists”; partly I think because they’re not even aware it exists, and partly maybe because a lot of travellers will think ‘ah, it’ll be just the same as India’. Oddly, that was one reason Bangladesh has always intrigued me – I’ve always felt as a solo traveller that India would be just ‘too intense’, so, having been to Sri Lanka, Bangladesh is the next logical place to go to experience ‘India Lite’. Pakistan is also on my list but that requires far more admin – I could get a visa on arrival in Bangladesh (for UD$51), but for Pakistan I’d need to apply in advance and give them all manner of details, before waiting to see if it’d have been accepted. Unlike Sri Lanka, Bangladesh is a lot less attested by travel bloggers. Indeed, before my trip, I realised just how few of my internet friends had even been there – and the majority of those who had were ‘indifferent, bordering on negative’ – too crowded, too dirty, too disorganised. Hmmm, white privilege abounds, methinks. My visit to Bangladesh was fairly accidental and a very last-minute decision. I’d been travelling in Philippines with my friend Laura, and the plan had been for me to go to Hong Kong with her, then I’d fly to Nepal via Kuala Lumpur. However the cost of the ticket from Philippines to Hong Kong was more than the price of new tickets to Nepal via Bangladesh. So I figured while I was in the area I might as well check out a new country – I booked to spend a week there before heading to Nepal as planned. I’m not sure I had many prior impressions of Bangladesh. I knew already that around 90% of “Indian Restaurants” in the UK were run by Bangladeshis rather than Indians, and I already knew a little bit of the country’s history, but I had no idea what to expect from the country – all I really knew about it was it tends to flood a lot in the rainy season, that it was a majority Islamic country so I was unlikely to find a decent pint of beer, and that it would be pretty hot. I kind of knew already about Dhaka. Bangladesh is one of the most densely populated countries in the world – its population of 166 million people makes it the 8th most populous country in the world, yet it’s only the size of the US State of Iowa – this makes it the most densely populated country in the world over 1,200km² (there’s a handful of small city-states, eg Monaco, and island nations, eg Malta, with a higher density). This means that everywhere you look there are people, there is traffic, and there is pollution. 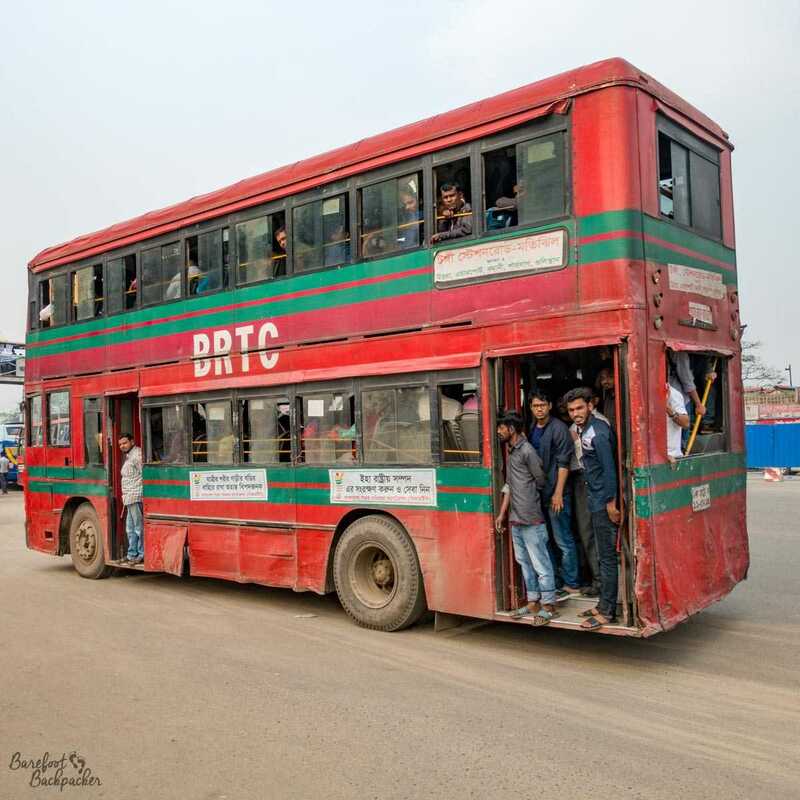 Now, granted, the most common form of transport in Dhaka is the CNG (a gas-powered tuk-tuk), but a city of 19 million people means there’s an awful lot of other transport out there – mainly buses and cars; there is a small suburban rail network but the majority of transport seems to be on the road. This leads to two issues – firstly it’s often marginally quicker to walk short distances than drive – indeed the bus from Dhaka to Sylhet takes 7 hours for a 235km journey, but the first hour and half is literally getting out of Dhaka (on the way back, I flew – 45 minutes, £35, and the airport in Dhaka was a 15 minute walk from my hotel! ), but secondly, the air quality is pretty dire. There’s a website that tracks air quality (Laura currently works in Shenzhen and the local officials there dismiss the site as ‘western propaganda’); values above 100 are ‘unhealthy for some’, over 150 is ‘unhealthy for all’, and over 200 is ‘getting dangerous’. In the evening peak on the day I’m typing this, Dhaka’s level rose to 247. In comparison, Nottingham (my nearest city) peaked at 66 and is generally below 50 most of the day. To be fair to Bangladesh, the chest infection I came back home with, and which stopped me from going to Japan three weeks later, only presented itself after a couple of days in Kathmandu in Nepal, surprisingly an equally polluted city, but I’m sure my experiences in Dhaka didn’t help. 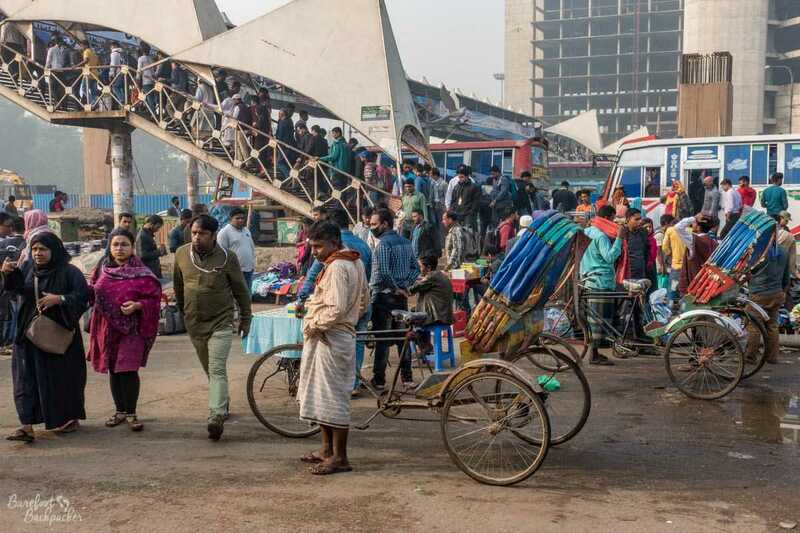 As already intimated, Bangladesh in general, and Dhaka in particular, is an incredibly densely populated place. The buses that pass by, even in the suburbs, are jammed with people – to the extent that would-be commuters literally push each other onto the bus as it passes – the buses rarely come to a complete standstill at bus stops, instead crawl inexorably to their destination in the traffic, so sometimes even the very definition of a bus stop is called into question. 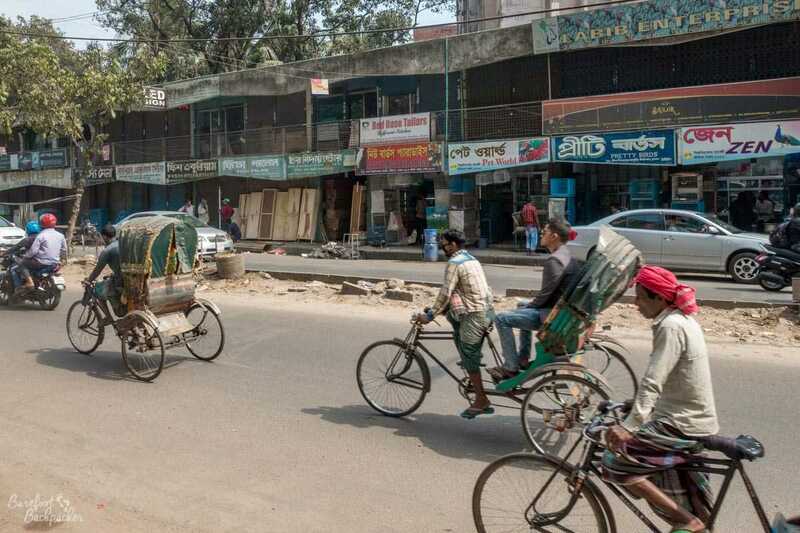 The rest of the roads are filled with cars, motorbikes, bicycles, rickshaws … every spare piece of road space is either about to be occupied, or has just been occupied. It’s quite amazing there aren’t more accidents than there are. It’s a strange feeling to be on the road, travelling inside, say, a CNG – you really feel you are genuinely putting your life in someone else’s hands. Crossing the roads is a feat best done at 2am. At various points though there are footbridges, identifiable as a seething mass of people narrowing into the same space. You don’t so much as climb the stairs as are ‘guided’ up them in the same way a twig is moved by a stream. It’s not just on the roads that see a mass of people. What passes for pavements are filled with people walking, at least when there aren’t stalls in the way. At every major road junction or roundabout you have to weave your way past CNG and rickshaw drivers touting for business, people sat behind wooden counters selling all manner of clothes and accessories, and simply people walking past on their way somewhere equally as crowded. So there I am, minding my own business, taking pictures in a major square in Sylhet lined with typical architecture, when I hear a voice call to me from behind., I turn around and there’s three young men coming towards me. Now, at this point, your mind races with all manner of queries and worries, but before I can react they ask the one question that I’d been hearing a lot throughout the whole week: “Can we have a selfie with you?”. 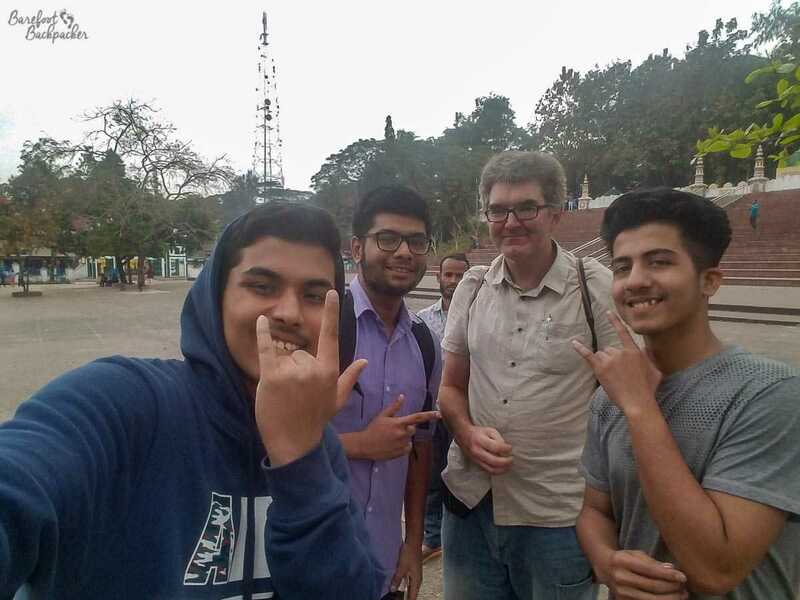 It turns out that these three are students from the local college, and curious about what I was doing visiting Bangladesh. But what I found in my time in the country is that, rather than talking to me first and then asking about selfies as a parting shot, their opening gambit was to request a selfie and then they’d ask me where I was from etc. I found it interesting that there seemed to be no particular demographic around this either; in my time in the country I was approached for selfies by children, students, elderly women, family groups, and tour parties. Pretty much everyone who is anyone wanted to have their picture taken with me. I don’t know if it was because I was obviously a foreigner and they were intrigued by my presence, but while not as prevalent as Hong Kong (where pretty much everyone was taking a selfie), certainly I saw many Bangladeshis taking pictures of themselves so I guess it’s a natural part of the culture regardless of my presence. Although having a tall hairy white man in their pictures is presumably good for bragging rights. Shame I’m not the most photogenic of people! One of about 12 selfies that a family group requested of me at Ratargul swamp forest, near Sylhet. While some of them were just interested in the selfie, some, like the students in Sylhet, used the selfie as a ‘way in’ to having a longer conversation with me. Now, paranoid, suspicious, me is always wary of this sort of thing as it usually ends up with them trying to sell me something or otherwise want some money off me. But I have to say, this simply didn’t happen with Bangladesh; people were genuinely purely curious about me. 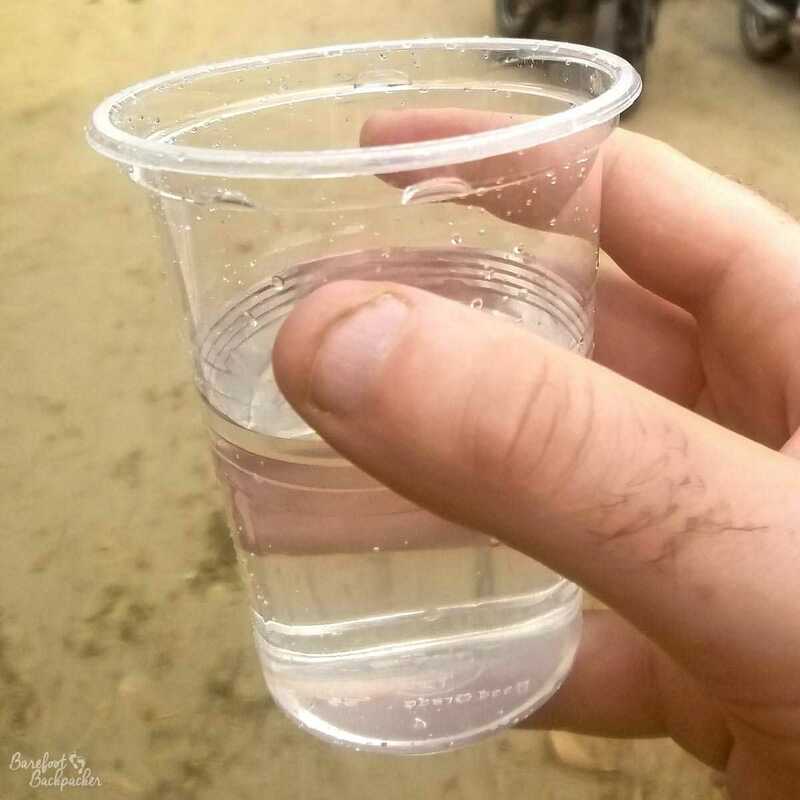 Also in Sylhet a chap on a moto-scooter saw me walking up the road and insisted on giving me a lift – we ended up gliding around one of the tea plantations, he gave me a sample of the local illicit moonshine, then dropped me back off where he’d picked me up, no questions asked. It was strangely liberating. For the record, the illicit moonshine was particularly foul. It was smooth, tasted faintly of tea, slightly roasted, and … didn’t lend itself well to a second shot. Illicit moonshine, Sylhet. Looks like water. You drink it like rocket fuel. Bangledesh is 90% Islamic. Although at one point on the bus from Dhaka to Sylhet I saw a huge billboard advert for Tiger beer, it may not surprise you to know that I didn’t drink any alcohol in my time in the country. Rather, all my drinks were water, juice, or the occasional lassi (yoghurt-based drink very popular in South Asia). The main drink in the country is tea. Across the border is the Indian state of Assam which is of course world-famous for tea, and the tea-growing area stretches across the border. Sylhet and nearby towns (like Sreemangal) are noted for their extensive tea plantations that surround them (one of them, Lakkatura, apparently covers an area of around 1600 acres – around 900 football pitches) and walking around them is a very popular way to spend a chilled day. I was there in February, which isn’t quite tea season – people start picking the tea leaves more towards the end of March – which made the plantation a little quieter than it often is, but that just meant I could admire the scenery more. 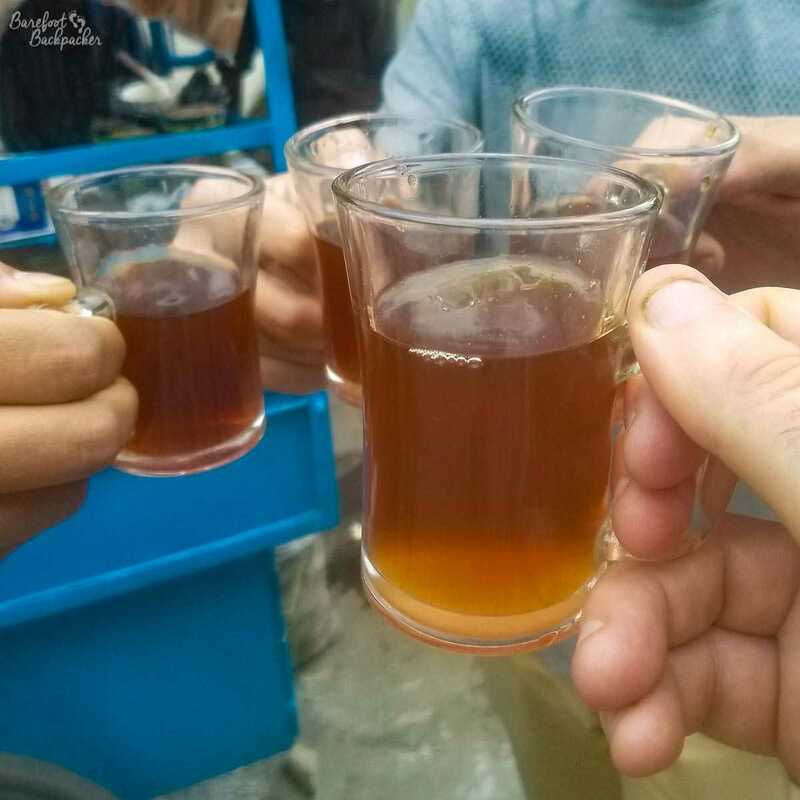 I’m not terribly fond of tea – I find it quite boring – but even I had a couple of glasses in the town; lots of sugar and absolutely no milk, of course, which isn’t the way the locals drink it, but we’re all different. Tea is available across the country, often simply from stalls in the street. 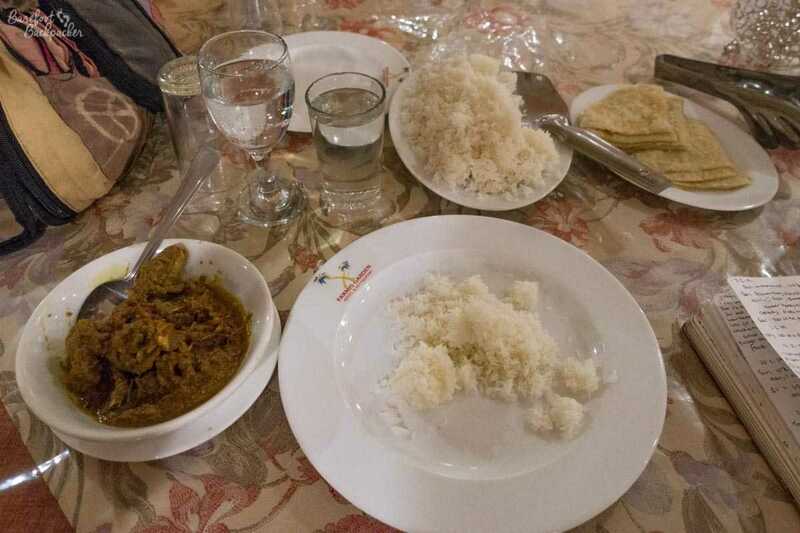 Tea is not the only reason why a Brit might feel at home in Sylhet. 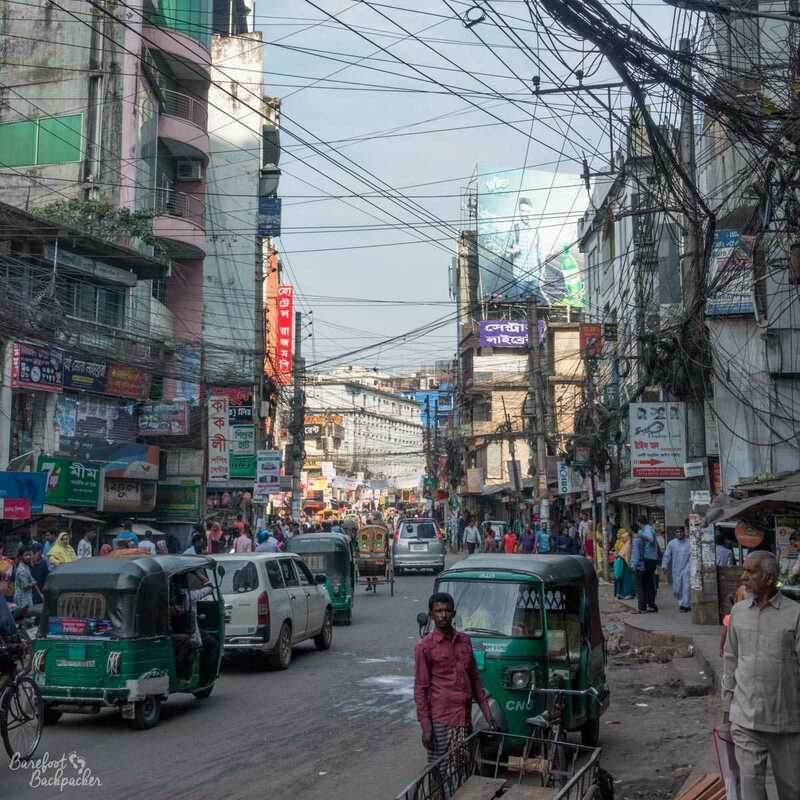 It was estimated back in the 1980s that 95% of all Bangladeshis living in the UK came from this particular part of Bangladesh – indeed the town is twinned with the London Borough of Tower Hamlets (Brick Lane, yes). It has also been estimated than some 90-95% of so-called ‘Indian’ restaurants in the UK are run by people of Bangladeshi origin. It therefore follows that the vast majority of Indian food made in the UK is made by people from Sylhet. Indeed the chap who ran the hotel I was staying in in the town used to run an Indian restaurant in Gloucester, near the Cathedral. It’s therefore a great place to get a biryani or dopiaza. Just don’t expect a lager with it, of course. The other thing to bear in mind is the way to eat. Cutlery is optional; rather, even in fairly fancy restaurants, you take your naan or chapati in your (right!) hand, scoop up the curry with it, and eat. It’s remarkably liberating to eat with your fingers in public. I am sure some people reading this will be thinking ‘hm, I don’t trust the banking system or the currency; let’s just take large amounts of American dollars and change it as we go’. Ignoring the fact that if you qualify for a visa-on-arrival that ideally would be paid in US$, and ignoring that the Bangladeshi Taka isn’t a currency widely changeable in other countries, my personal experience is that relying on large amounts of foreign currency isn’t necessarily useful. Some hotels will allow payment in US$ (at a slightly unfavourable rate, natch), but in general, the Taka is king. The best way, the most convenient way, the easiest way, to get Taka is to withdraw it from ATMs. There are ATMs everywhere in the cities, usually associated with banks. Indeed there are far more ATMs than banks; many signposts for banks actually direct you to ATMs, hidden behind doors, often with security guards outside guarding it. Withdrawing money from ATMs in Bangladesh is very easy and probably very safe. Finding a bank with counter staff, as opposed to a simple ATM, is hard enough. Then, when you walk in, you find that either they don’t offer money changing facilities, or if they do it’s purely for trade or import/export purposes, rather than for the general public. Money exchange offices are almost non-existent (I didn’t see any in my entire time in the country). I did manage to change money in Dhaka, but the circumstances were quite … shall we say, oblique. I went into one bank and, despite the value of currencies being displayed on an electronic board, they said noooo we can’t change money here, that’s just for trade. I asked where I could change money and they told me there was an exchange office about 5 mins walk away in a shopping centre. The shopping centre was nearer 15 mins walk away but that’s by the by. It was a small mall called the Eastern Plaza, consisting of five floors, and where each floor seemed to be dedicated to a specific good. For example, one floor was entirely made up of stalls selling fabrics, one full of gold/jewellery shops, and the top floor was electronics/mobile phones. As an aside, this seems to be quite common in Dhaka. I walked down one street with nothing but tile shops/ceramics, and another that was nothing but pet stores, one after another. 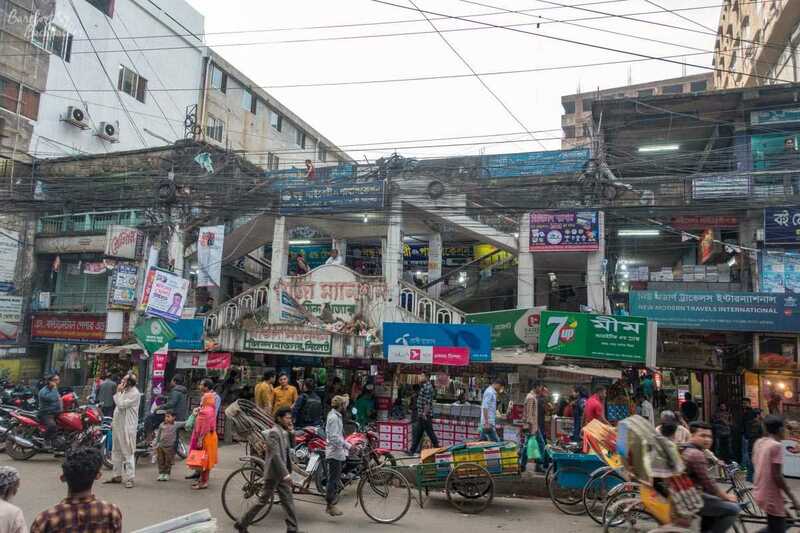 Example of a street in Dhaka, lined with mainly animal/fish stores. Anyway, I wandered around all five floors but couldn’t find anything approximating a money exchange. I had to go back to the ground floor and ask security, who told me it was on the fifth floor. Back up I went, but didn’t see it. I did, however, find another bank, at the near end of the floor, so figured this is where they meant. … It turned out at the back end of the mall there’s an unmarked staircase down a side passage. It looked for all the world like a maintenance staircase or staff passageway, with lockable gates on it – the other floors were all accessible via centrally-located escalators. So up I go. … it led into a mosque ?! This, naturally, confused me, but a couple of people on the stairs assured me that yes, there’s a money exchanger here, in the passageways behind the mosque. However I’d have to wait about ten minutes as he was currently in the mosque at prayer. A few minutes later and he did indeed come out, and was more than happy to exchange me some money – he even gave me a better rate than I was expecting. So, a little tip for you – if you need to change money in Bangladesh, find a mosque. Even if it means going to the sixth floor of a five-storey shopping mall. Floating on the water in the Ratargul swamp forest. Despite its size and its population density, there are large areas of countryside where you can explore and feel like you’re in a completely different place, far from the madding crowd. The tea plantations in the east are a good example of this, but in general the rolling hills, rivers, waterfalls, and picturesque temples make good hiking country (for example, the region around the town of Jaflong, near the Indian border) – indeed the far SouthEast has the Chittagong Hill Tracts, with points as high as 900m; a far cry from the flat, flooding, plains of the centre of the country. Of course Bangladesh is also noted for two famous areas of scenery. The Sundarban Reserve stretches along the coast and while many people visit the Indian side, near Kolkata, 60% of it lies inside Bangladesh. 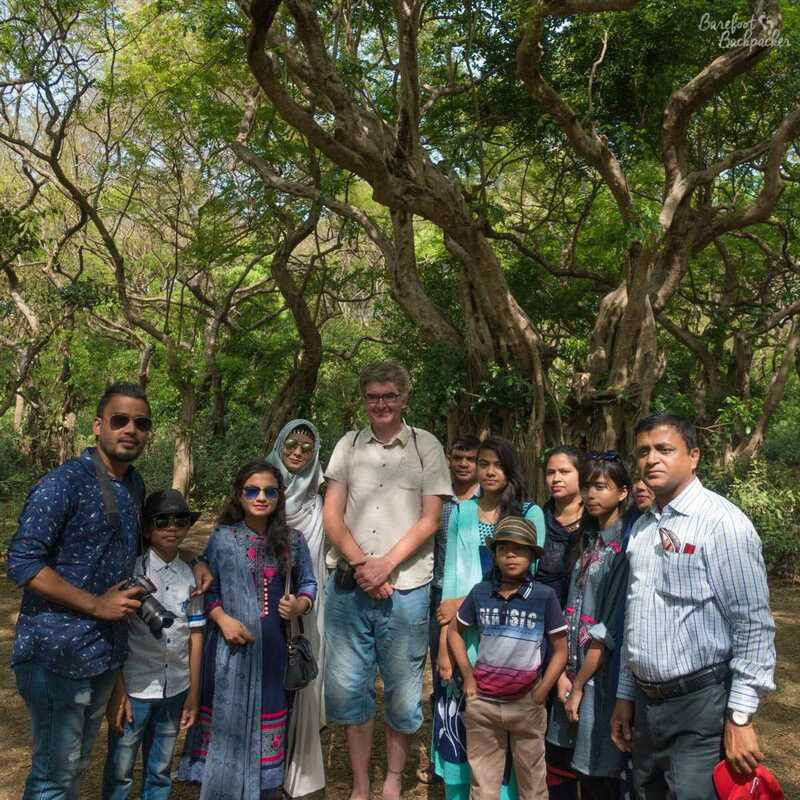 It’s a mangrove forest, wetland area, and prime spot for safari adventures, including the chance to see the rare Bengal Tiger. Over in the east, near Chittagong, lies Cox’s Bazar, which is the longest natural sea beach in the world, stretching some 120km. It’s not my scene – I’m not a beach bum, as you know – but it’s certainly an unexpected find in a country like Bangladesh. There’s also a huge history in the country, as you might expect. In the west of the country are the divisions of Rangpur and Rajshahi; here you’ll find ancient ruined cities and temples like Paharpur Vihar, Mahasthangarh, and Puthia. Remember the region now known as Bangladesh has been inhabited for at least 20,000 years; it’s where two of the most important rivers (both economically and spiritually) in the area’s history – the Ganges and the Brahmaputra – reach the sea, and unsurprisingly places here are mentioned in some early sacred Hindu texts. As previously mentioned, I wandered around one of the tea plantations on the outskirts of Sylhet. It’s a very pleasant way to spend an afternoon – there’s a couple of roads that wander through them and pretty much all you can see is tea plants; it doesn’t feel like you’re within walking distance of a city of just over 500,000 people. 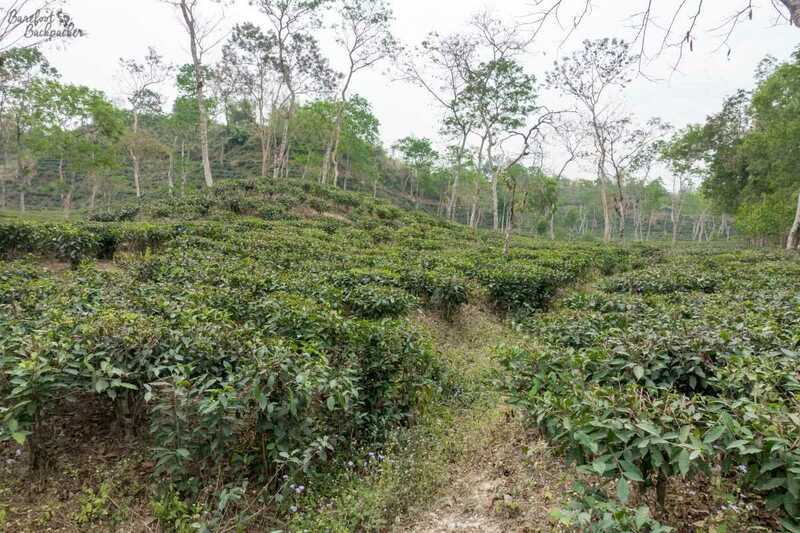 A tea plantation near Sylhet. It’s green as far as the eye can see. Another site I did visit was the swamp forest at Ratargul, a little way north of Sylhet. It’s a simple tuk-tuk ride from town, and it drops you off at a small wharf from where you can hire a boat and oarsman (often a teenager) who’ll sail you out for an hour or two on the water. 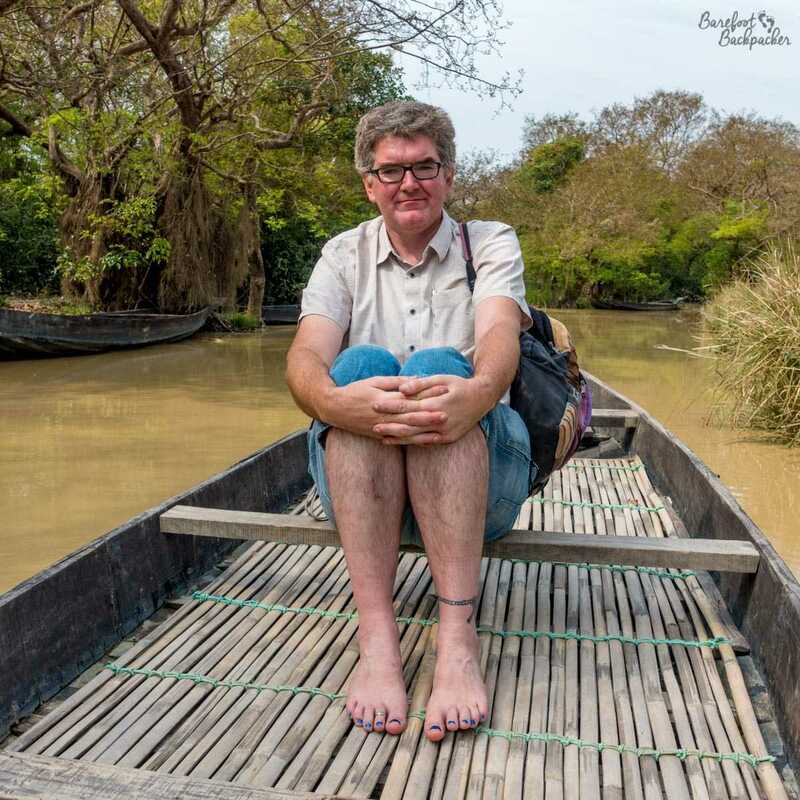 It’s a really nice woodland, with gentle rivers wandering through; very peaceful and serene, save the boats of locals who all want the obligatory selfies with you as you’re the amazing foreigner. In one part of the waterway is a lookout tower, from the top of which you can look out across the whole wilderness. It’s a very beautiful place and so unexpected compared with the rest of Bangladesh. 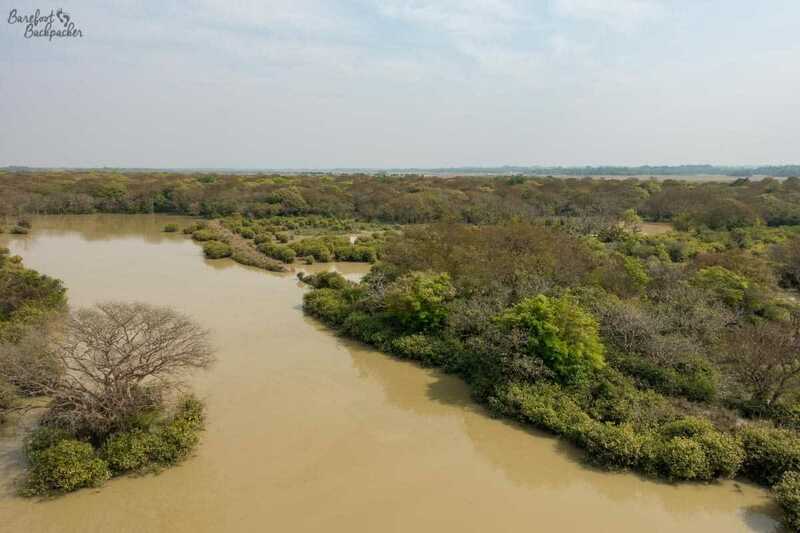 Overview of the Ratargul swamp forest from the lookout tower. 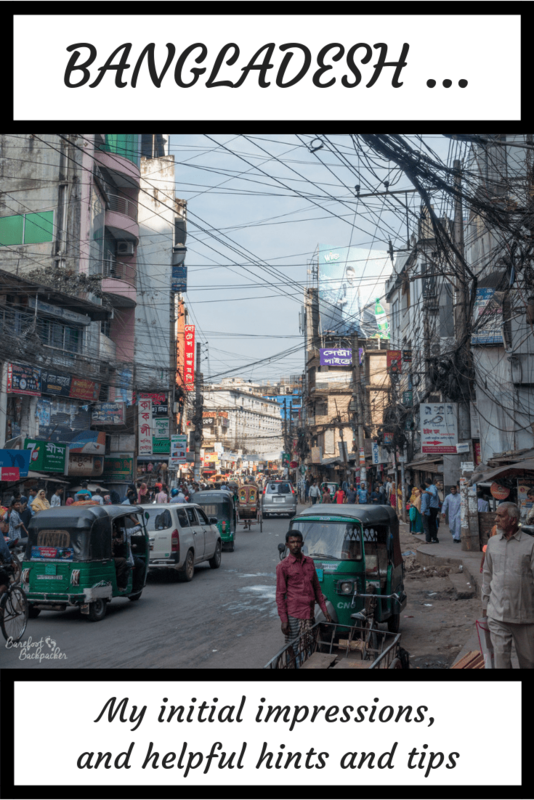 For a country that’s not very well attested amongst travel bloggers, the impressions of Bangladesh I had in my week there were that it was an incredibly interesting and rewarding country to visit, and I’ll surely be back – there’s so much stuff I didn’t get to see. I suspect it might also be interesting to compare/contrast with areas just over the Indian border – so I think that’s my plan for 2021! What a great post. Bangladesh is one of those places I’ve often wondered what it would be like to visit.